President of the Generalitat de Catalunya explained today in Brussels that “I do not expect the EU to do the work for us, but I do expect it to support and promote the value of democracy”. He asked the EU, in case the Spanish state“fully rejects the possibility of the Catalan people to be consulted on its future, to give support to the democratic will of the Catalan people”. The head of government made these statements in response to questions by journalists during a press conference he offered this morning at the representative office of the Catalan government in Brussels. The President travelled to the Belgian capital today to deliver the conference “Destination Europe: Catalonia’s EU future”, organized by think-tank “Friends of Europe”, one of the most influential think-tanks in Europe. 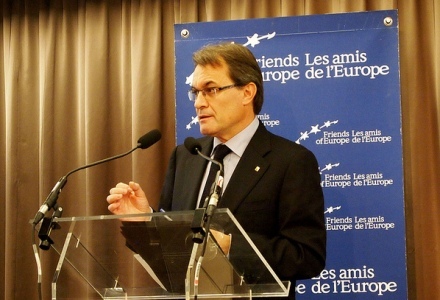 Artur Mas made an appeal to the EU to give support to the Catalan process of self-determination and reminded that the European Treaties “do not establish that Catalonia would remain within the EU, but neither do they provide anything to the contrary”, to which he added that they do not determine either which would be the position of the Spanish state “in case an institutional separation takes place in Spain”. 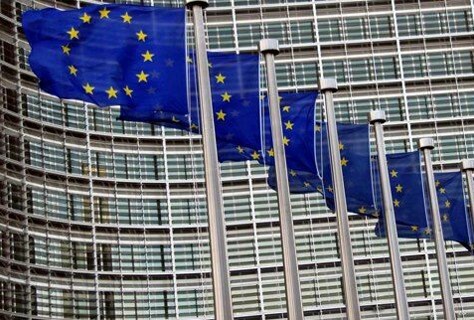 The President expressed his desire, as a European citizen, that “the European institutions, instead of excluding people, will continue to include them, as they have done over the past decades”. 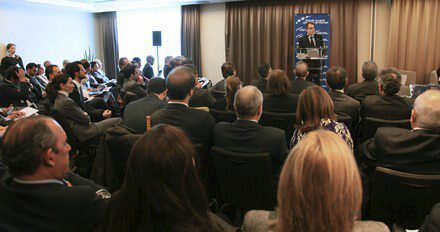 During the press conference, Artur Mas explained that “it is the will of the Catalan people to continue within the eurozone and the EU”, adding that “the question is whether the European Union is prepared to offer solutions to peoples such as Catalonia which only want to change their political status”. “Our goal is not to separate ourselves from the rest of Europe, the only thing we want is to change our political status”, he concluded. President Mas, who pointed out that he travelled to Brussels to explain the current developments in Catalonia, stated that “we are seeking the same instruments available to other states in Europe of a similar size as Catalonia, but within a strong and interdependent Europe”. The plebiscite will be held “no matter what, which does not mean outside the law”. Responding different journalists, President Mas insisted that the Catalan people will be consulted on its future during the next four years and made clear that “our objective is to do so within the legal framework”. He denied “having intentions to hold an illegal referendum or hold one outside the existing legal framework”. He explained however that “if there is no possibility of holding a referendum with the agreement of the Spanish government, we will seek to do so in accordance with other legal frameworks”. “On some occasions I have said that the referendum will be held no matter what, which does not mean outside the law, but possibly using alternative legal procedures”, he stated. With regard to the criticism on the part of the Spanish government, stating that Europe would oppose Catalonia’s access to the EU, the head of the Catalan government showed himself perplex, “not so much by their statements as such, but by the way in which they express themselves, doing so without taking into account the voice of the Catalan people expressed at the ballot box”. This made him wonder “whether one can govern systematically against the will of a people? Is it possible to blot out forever or for decades the democratically expressed desires of a people, or would it be wiser to sit down and seek solutions which are suitable for all parties involved?”.